FixCleanRepair is the PUP that uses misleading techniques to prevent removal. Use Reimage to locate malicious components and get rid of them faster than with uninstall instructions. A full system scan blocks virus reappearance and prevents traffic to malicious domains. How did FixCleanRepair hijack my computer? 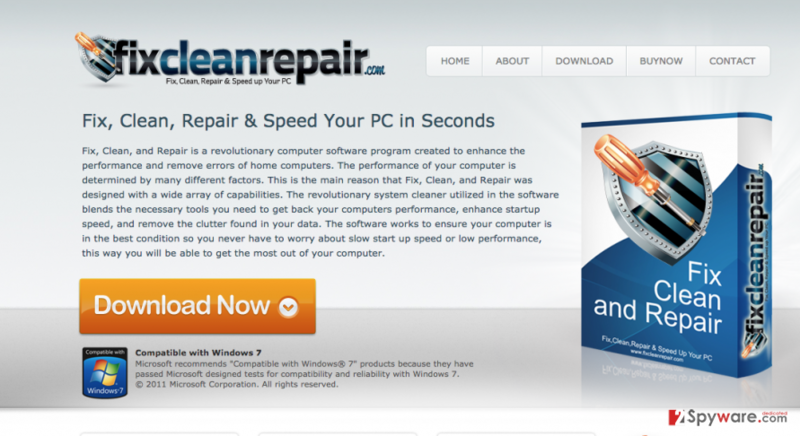 FixCleanRepair is an application which is supposed to improve your computer’s performance. As the official website presents, the app speeds up PC’s performance, cleans it from malware, backs up and recovers files, cleans registry and junk files, defrags the disk, deletes broken shortcuts and also manages computer’s startup. This presentation should definitely make you think that it is a very useful application and we must add that the website of this app is designed really professionally. Sadly, but we have to warn you that this is just an image that is used for promoting it. When you get the free version of this program, it see that it warns you about hundreds of different PC problems and errors. In addition, you are informed that if you wish to remove them, you will have to buy the full version of the program. However, the scan doesn’t detect real problems as it only checks just several areas of your disk. FixCleanRepair potentially unwanted program (PUP) can be downloaded from the official website, fixcleanrepair.com, or there are chances you installed it with a bundled app pack. If you recently downloaded a freeware and installed it in a hurry, you probably skipped some installation steps. When you install a free program to your computer, make sure you always choose “Advanced” or “Custom” options. Uncheck any boxes that suggest additional apps or toolbars. Creators of the freeware almost never inform the user about additional applications bundled together with the program you wanted to get. These programs are usually concealed under “Default” install options which majority of users choose. Please always pay attention and download files only from trustworthy and known websites to avoid infections. We also recommend you to install Reimage, Malwarebytes MalwarebytesCombo Cleaner or Plumbytes Anti-MalwareMalwarebytes Malwarebytes and make sure that your computer is free of viruses. This entry was posted on 2015-09-24 at 03:30 and is filed under System tools, Viruses. You can quickly scan the QR code with your mobile device and have FixCleanRepair manual removal instructions right in your pocket. How did you remove FixCleanRepair?